Does Own The Racecourse work? In this episode, you’ll get incontestable proof of how effective the publishing method is and find out how you can apply it to your own website. 04:13 – Feature posts or just opt-ins? 04:40 – How good was your very first post? 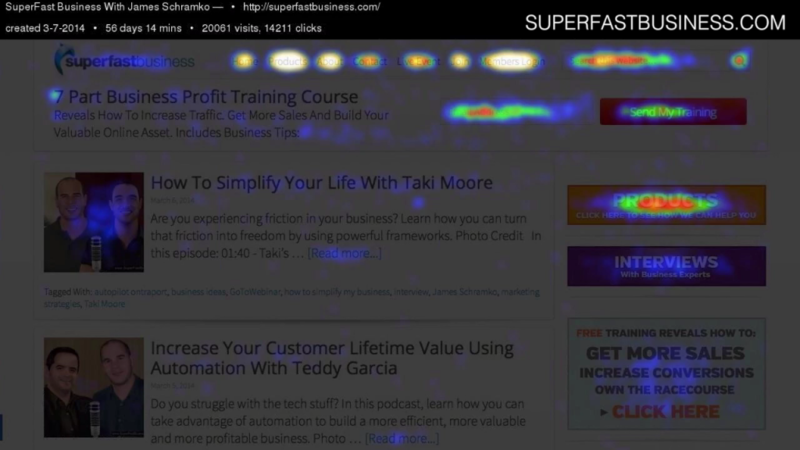 05:59 – Want a site that performs like this? These are what people are clicking on my website. You will see that my navigation has been pretty effective. There’s no duds across the top of my navigation, and this is through years of testing. If you look at the original OwnTheRacecourse training, you’ll see that I’ve put some heatmaps in there of what it used to look like and what it ended up being. It’s very, very clear, and your action item for this is to write down anything you’re missing from your navigation, and to update your website, and report back where this recording is on what happened. And if you’re using Crazy Egg, do your changes and then start a new test. Export your old one. So this has happened in just under 2 months. People are clicking on home, they’re clicking on products, they’re clicking on about, or if you’re in Canada, “aboot” that’s just for you, they’re clicking on contact. Now my Contact Page got written up recently in the Internet Marketing Super Friends community as a best example of putting address, phone number, Skype, social media pages, it’s got a trust seal, it’s got how you can contact me and links to my About Page. You really should have a look at my Contact Page because if you were wavering on whether you’d buy from me or not, the contact page gives a little bit of reinforcement. These are real business. There’s also the live event tab, the join tab – how people can join SuperFastBusiness membership, the members log-in, which is where a lot of people go to log in to the membership is through this page. Now the really interesting stuff I think is the “search this website.” It’s just phenomenal. And I put this as a feature because Ezra was teaching me that on his e-commerce sites, the 5% of people who purchased were buying 20% of the stuff. So if someone searches your website, they are looking for something. And if they’re looking for something, they probably want to buy something. So cater for people who want to search your website. Obviously my opt-in in the top header bar is getting a lot of input. Email address is being put there and then the “send my training” click, and somewhat to my delight, the Products tab is getting smashed, it’s getting belted. That’s exactly the point of this website. The point of this website is to attract and convert. To attract people to my site with great content, like a venus flytrap, and to steer people into the products page primarily, and the opt-in secondarily. Now some people are clicking on the Interviews tab but not everyone, but that’s OK. And then the next button there is the opt-in to OwnTheRacecourse, which is the same as the one in the header bar. It’s kind of like the next phase of catching in. Below that we have the free business course, which is kind of new. And then we had, we replaced the live thing with the Live tab. The people are clicking on the read more post, and they’re clicking on the pictures. You absolutely have to link pictures. You must link pictures because people click on pictures. I’ve learnt this time and time again. And on the footer, this is fascinating. People are clicking on the second page, what is next, what’s the next range. If you only had three posts on the homepage, probably, think of it like a long-line fishing trawler. You know if you’ve got 10 posts or seven posts, you’ve got seven hooks on that line. If you’ve got three posts, you’ve got three hooks. If you’re doing a blog style content, now what’s the delineator here? My recommendation would be if you have more than 50% of your traffic coming back over and over again, you probably want more feature posts, like more posts on the homepage. If you’ve got less, if you got 99% of your traffic coming once only, then you really just want an opt-in. That’s it. You know in my case I got 65% of my traffic comes back over and over again. So I’m going to have 10 posts on the homepage. And the fact is a lot of people are clicking on the second one. They want to see what’s on the second page, but the really interesting is last. A lot of people click on last. They want to go and see what was the first stuff, how old is this blog, where did it come from, what’s the history, how do I learn more about this guy, what was the seed of it? If you’re doing a podcast, you have to have a lot more effort into your first podcast episode than any of your other episodes ‘cause more people are going to go and listen to it over time than any other episode. I can guarantee it based on all of my stats. Every podcast I’ve ever done, the first episode gets the most listens. Now, on the bottom there on the navigation, there’s a few clicks on disclaimer and privacy. But there’s a lot on “we supply services,” which is a link to a hidden page. It used to be called reseller services. Paypal did not like that. They don’t want you to use the word reseller. So it’s we supply services. And the other one is who built this site. We’ve also used curiosity, instead of a link to the website development company, which obviously is us. And then there’s site map, which is a new addition. But we put that there, it helps us but it also is really good for uses. And now you’ll see there’s a Trustwave seal, and some people click on that, too. Is this a valid company that I’m dealing with? All right. Now, you might be wondering how could you make your website perform as well as my website. The short answer is you can buy this website for $299. We will install it, and move half a dozen posts across. Just go to the Products Page, click on “I need a cheap website” and find the SuperFastBusiness theme, it’s called OTR. The OTR theme, it’s $299 and you can have it installed on your server within a day or so. If you can give us all the details for logins, etc., and you can start getting the conversions that you deserve. I want to emphasize this website drives millions of dollars in sales. And it gets me about between a thousand and 2,000 opt-ins per month, using it exactly how I use it now. Why am I letting you buy this? Because so many people rip me off and copy it anyway. You might as well get it built by the same team. It works on any device, it’s fully responsive, which means we’ve coded it for 35 hours to work on 5 different sizes. It’s supported by my team, it’s installed by my team, and you know that it’s going to be good. And I’ve bug tested it. It’s based on Genesis, it’s very robust, and I’ve poured hours and hours and hours in the last few years into this. I would have spent $10,000 worth of labor on tweaking and tuning, you’ve seen it grow from the beginning. And you can start with this as your benchmark. The second reason is it’s going to force me to innovate. I’m going to see if I can beat this template in my next iteration and of course I’m going to share the results with you because you’ve paid an investment in your membership to learn directly from me what’s working. I hope this heatmap is delivering on that promise. Thanks for the translation on “about”. I got a little lost. Really generous share James – thanks! Going to crack out my crazyegg code again – haven’t used for a while.